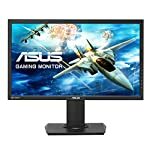 The G2460VQ6 is a budget gamer friendly monitor with FreeSync and it has a number of things going in it’s favour. Given the price you get a lot of gamer functionality baked in; ultra fast response times, AMD FreeSync technology and it also manages to break free from the standard 60hz frame rate, not by a lot, but it can jump up to 75hz. As a previous owner of a 75hz monitor I can recommend even this small increase in refresh rate, there are big gains to be had from small increases, the improvement diminishes as you go up the scale. It’s only a 24″ screen and many are now moving to bigger displays for the gaming. I actually quite like the 24″ size, it’s good enough and not all of us have big desks. Two of these set next to each seems a nice set up to me, affordable too. If a bigger screen is your preference then you’ll have to look else where but if you love the 24″ form factor then you can save yourself a lot of money. The G2460VQ6 falls into the budget monitor range, and is one of the cheapest screens you can buy right now with adaptive sync technology (FreeSync). If you are familiar with AOC’s other monitors you’ll notice it is a standard looking affair, with a touch of red to ensure you know it’s a gaming monitor! With VGA, HDMI, and DisplayPort connectors you should have no problem hooking this up to your graphics card. Whilst the stand provides a stable base it isn’t the most adjustable, according to what I’ve been able to find out, you only get a tilt option included. The monitor does feature speakers but owners have reported that they are a bit of a let down, still, I don’t think sound quality is the number priority for buyers and you can always connect up your own speakers or use the included headphone socket. One of the advantages of sticking with full HD is that you don’t need a high end graphics card (or two) to power the monitor. It’s easy to lust after a 1440p screen or even 4k but at the time of writing you’ll need an “enthusiast” level GPU to get decent performance. The G2460VQ6 features a TN panel which gives you super fast response times, the downside of this is that the colour accuracy is not so hot and deteriorates when viewed from odd angles. This isn’t the monitor’s fault, it’s an issue with the technology. If colour accuracy is important then you might want to consider an IPS screen, but these can be more expensive and typically have slower response times. AMD’s FreeSync system ensures beautifully smooth tear free images even during the fiercest fire fight, assuming you have a compatible AMD card of course. Note that you can use the monitor with other cards but you won’t be able to turn FreeSync on. This is handy to know if you are future proofing and looking to buy a new card later. 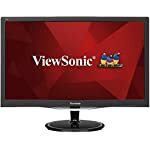 The extra boost to 75hz gives you an edge over 60hz screens, and personally I found this to be very useful back when I was playing competitive FPS games. The AOC also comes with their Anti-Blue Light Technology, which reportedly “takes care of your eyes”. I don’t know if this makes a real difference or not but it’s nice to know they’ve got your back. Owner reviews on Amazon do mention that it makes for comfortable reading so maybe there is something in it! 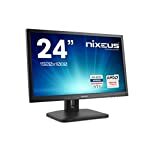 If you buy one of these monitors, do let us know what you think! We give the AOC G2460VQ6 a 4.5 out of 5 rating. Want to know what existing owners of the monitor think? You can read real user reviews here. 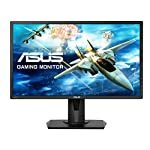 Should I buy the AOC G2460VQ6? 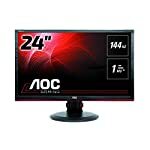 The AOC G2460VQ6 is a keenly priced monitor that will give gamers a great experience, if you have no inclination to spend more, don't need a large screen and your PC can't run a 4k screen anyway then this looks like a nice choice. The inclusion of FreeSync is very attractive at this price point. If you are having some doubts about this purchase then why not read some real owner reviews and see what other buyers think.